Having a Glock cleaning kit handy makes keeping your pistol in tip top shape. Not only will it perform better and more accurately, but it will also make it more reliable in emergency situations. Gun performance is important considering that your handgun can protect you, your loved ones, and your property. Performing routine cleanings prolong the life of your handgun and provides a great opportunity to inspect it for excessive wear and tear or breakage. I actually love sitting down at my dining room table, spreading out a mat, and breaking down my handgun after a visit to the range. There is something oddly satisfying about assembling the tools from my cleaning kit and the familiar smell of cleaner. The ritualistic movement of sliding the rod all the way down the barrel, out the other side, before pulling it back through really calms my mind. Having all your cleaning tools neatly organized and contained within a kit help make cleaning more enjoyable and also more efficient. ﻿The problem is that there are a ton of options to choose from. 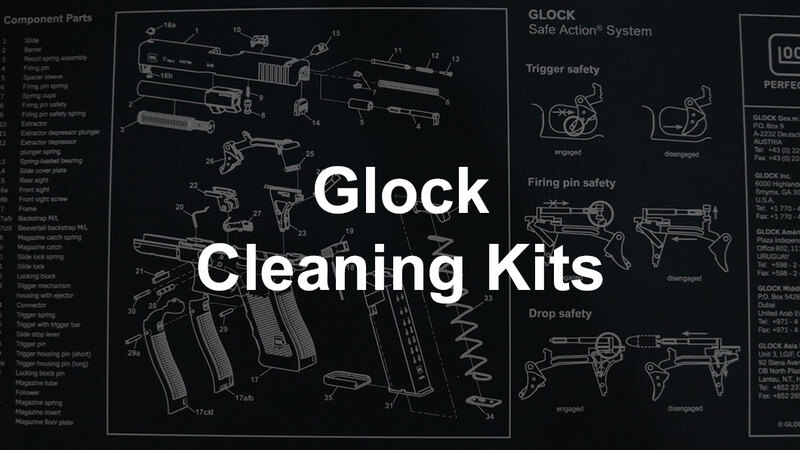 That's why I went out and did the research, and rounded up the top 5 cleaning kits for your Glock 17, 19, 22, or any other model from this amazing product line of pistols. Real Avid’s Gun Boss Handgun Cleaning Kit comes in a nylon-covered molded water-resistant case that you can easily tuck into your field or range bag. In the case, you will find a 9-inch rod that breaks down into two pieces with a swivel adaptor, a T-handle, plus two slotted tips. It also comes with .22, .357, .38, 9mm, .40 caliber, and .45 caliber jags and brushes. Also included is a supply of cleaning patches that measure 1.5 inches by 3 inches and some that measure 3 inches by 3 inches. This kit contains a total of 50 cleaning patches. While it would be easy to add a silicone gun cloth to this kit, there is not room to fit even a small bottle of CPL. Real Avid stands behind their products. If there are any issues outside of wear and tear from normal use, they are happy to replace a part at any time. While this kit is designed and distributed in Plymouth, Minnesota, it is manufactured overseas. 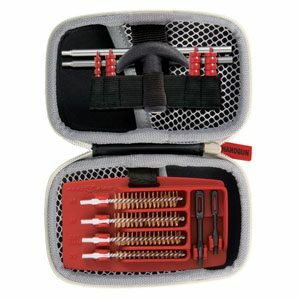 The Wydan Pistol Gun Cleaning Kit easily supports most caliber handguns. Everything is contained inside a black zippered case that measures 6.5 inches by 7.5 inches for ease of transport and storage. The tools are nestled within a foam insert, keeping each one in its rightful place. Inside the kit, you will find two brass rods for a combined length of 10 inches. It also contains five brushes, which come in .22, .357/.38/9mm, .40, and .45. There are also five mops in the same sizes, two plastic slotted patch loops which go on the end of the brass rod, and a T-handle. New users will like that the brushes and mops are all clearly labeled for caliber, taking any guesswork out as to which brush or mop to use. 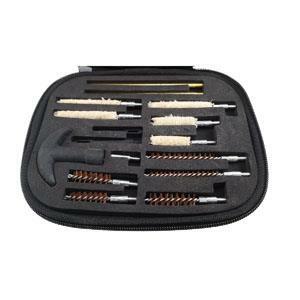 A few handy things that are not included with this kit are swiveling rod tip adaptors, cleaning solvent, and gun oil. Overall, this is an excellent starter kit. 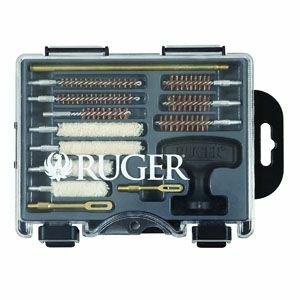 The Allen Company’s Ruger Universal Handgun Cleaning Kit comes in a heavy-duty hardshell case that is just less than 10 inches long by 6 inches wide. There is also a clear lid and sturdy black latches. Within the weather resistant case, you will find a brass rod that breaks down into three pieces. This cleaning kit contains the tools needed to clean your .380 ACEP, .357 Mag, .38 Special, 9mm, 10mm, .40 cal, .44 Mag, and .45 caliber handguns, including jags, mops, bore brushes, and a slotted tip. Also included are 20 cotton cleaning patches. This toolkit is thicker than it needs to be. You have plenty of room to add a silicone gun and reel cloth to the box. You will need to purchase solvent and lubricant separately as it is not included. 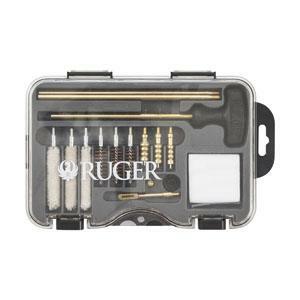 The Ruger Compact Handgun Cleaning Kit is manufactured by The Allen Company. This company was founded in in 1970 and specializes in outdoor, hunting, and tactical products. While some of their items are manufactured in the U.S., this kit is made in China. Everything is encased within a clear-lidded hard-shell case with sturdy black clasps. The case is 1 ½ inches tall by 7 ¾ inches long by 5 ¾ inches wide. All the tools snap into place inside the case, keeping everything organized and ready for use. This cleaning kit includes a single T-handle and brushes and mops for cleaning .357, .38, 9mm, 40 caliber, and .45 caliber handguns. It is made to last! The rod with a built-in swivel and two slotted tips are all made of metal so they will not break like the plastic ones. This kit does not include cleaning patches, CPL, or a silicone gun and reel cloth. It comes with a one-year limited warranty. 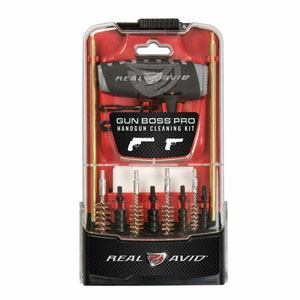 Real Avid’s Gun Boss Pro Handgun Cleaning Kit comes in a heavy-duty resin case with a durable clear polycarbonate cover. When flipped open, the cover turns into a stand to prop up the contents for your convenience. In the case, you will find a 12.5-inch brass rod that breaks down into two pieces. This rod is significantly sturdier than the 9-inch rod included in Real Avid’s Gun Boss Handgun Cleaning Kit. The handle is also larger than the one that comes in the Gun Boss﻿﻿. It is offset with added texture for improved grip and contains attachments that will allow the rod to spin or stay fixed for more control. 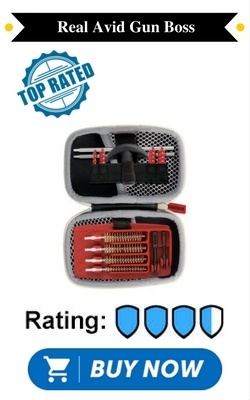 It also comes with .22 caliber, .357/.38/9mm, .40 caliber, and .45 caliber brushes and jags, a large and a small slotted tip, and a supply of 25 cleaning patches. This toolkit does not include a silicone cloth or a bottle of CPL. Real Avid products come with a manufacturer’s warranty against defects. While this cleaning kit is manufactured overseas, it is designed and distributed in the USA.